This article was originally published in the February 2018 Print Edition of Canadian Healthcare Technology. 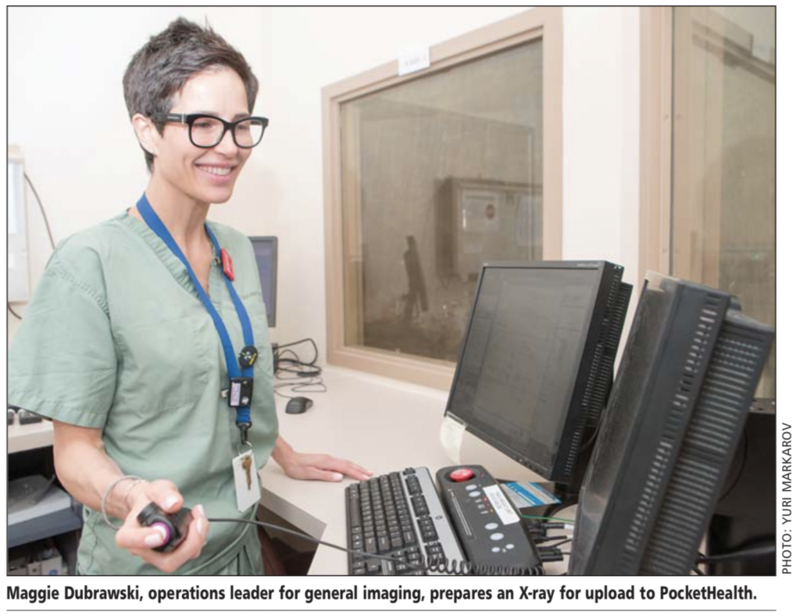 TORONTO – St. Michael’s Hospital’s new image-sharing platform, PocketHealth, puts patients first by making it easier to obtain and share medical images. Patients had to visit the hospital in person because they had to sign a release of information form, said Meher. And since orders took at least 48 hours to process, patients had to make a second trip to the hospital, to pick up their CD. While the CD was free, patients often incurred other costs such as public transit or parking. Frequently, it also meant taking a day off of work. If patients had specialists who also wanted to view the images, Meher said the process became even more arduous. Patients had two options. They could order extra CDs for themselves at $10 apiece, and then give copies to other physicians as needed, or they could get the CDs for free by returning to the hospital’s Film Library for each new request. Instead of waiting at least 48 hours, patients can get their images from the PocketHealth website in just a few minutes. After logging in and providing a credit card to cover the $5 fee for each new set of images, patients fill out an online version of the release of information form and then enter the date of when their images were taken. Moments after submitting the request, they have full access to all images. Moran said patients can store the images indefinitely on PocketHealth’s servers, knowing they’re always available to be downloaded or shared at no extra cost. Patients can transfer the files to their computers or USB sticks, and they can even burn their own CDs. If patients had images taken elsewhere, and they’d like to keep them with their other pictures in the PocketHealth server, there’s an upload function. And then, with just two clicks of the mouse, they can share the images with any number of physicians through the website’s easy-to-use interface. Patient control over the images doesn’t stop there, said Moran, because they choose how long doctors can access the images on PocketHealth’s servers. Doctors get an email, but no images or private health information is attached. Instead, there’s a password-protected URL pointing to both the medical images and any accompanying reports. Patients can deactivate the link at any point. Until then, doctors can view the images or download files in DICOM format for analysis. The next phase in integrating PocketHealth – ready in early 2018 – will allow patients to access their images moments after a scan, said Moran. Removing the time spent waiting for disks to be burned means patients can see doctors sooner. They can even send access to the images in advance of a visit, allowing doctors to preview images before a consultation. PocketHealth protects personal health information with 256-bit encryption, an industry standard that Moran said is one of the strongest formats available. PocketHealth is also compliant with the Health Information Protection Act and has built-in privacy features that include verifying a patient’s identity by OHIP number, date of birth and the St. Michael’s Hospital Medical Record Number. Integrating PocketHealth has resulted in improved efficiency at the hospital, said Meher. A 10 percent to 20 percent reduction in burning CDs, resulting from roughly 200 PocketHealth requests each month, has freed up staff resources to support other Film Library activities.